Do you feel you got too much song, video and very hard to find the song or video that you want to play? This software is targeting to allow you to manage your media files by assign metadata to them, e.g. song name, artist. This program will automatically grips information store in the media files. And it provides ��Replace�� and ��Pattern replace�� functions to help you to modify the metadata. This means you can modified multiple records in one shot which will greatly reduce the time use by modified or enter the data. Moreover, this program provides search, filter and sort functions to allow you to find the media that you want to play in a more efficient way. This program is already internationalized. It's label and all messages can be displayed in English, Traditional Chinese, and Simplified Chinese. All data is store in UTF-8 encoded string. 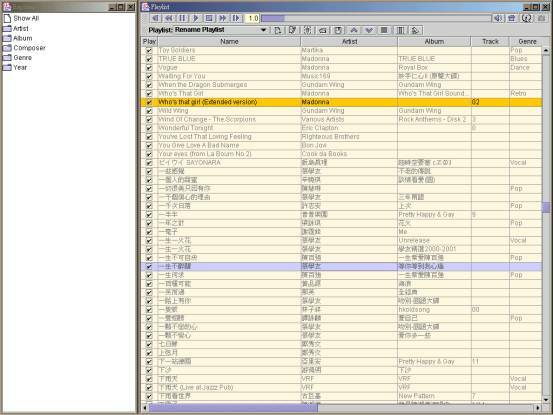 This means you can store multiple different languages in the same play list.